Finnish disability artist Jenni-Juulia Wallinheimo-Heimonen makes quite an impression. 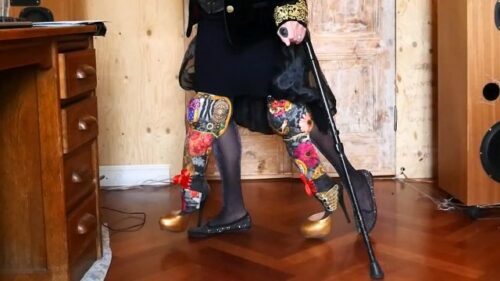 When she and Nina Muehlemann met at a Disability Arts conference in Bergen, Norway, she had a set of elaborately decorated prosthetic legs, complete with metallic high heels, dangling next to her own legs so that she could ‘dance in high heels’. NM: Can you tell me a little bit about the way you produce your artwork? JJWH: I am a textile and conceptual artist, making political disability arts. For me, the message is always more important than the material. Although I graduated as a textile artist, I also like hard materials – perhaps I want to challenge my body with brittle bones when I work with metal. Currently, I tend to create an object or installation with which I go to public places to perform. Afterwards I edit a video about the performance/event and put it on YouTube. In public places I reach people who would never come to a disability arts exhibition and with YouTube I reach people who might find it difficult to leave their homes. NM: Your work is so imaginative – some of the things you create look so dream-like or out of a modern fairy tale. Where do you get your ideas? JJWH: When I sit and make slow needlework I often come up with many new ideas and when a piece is finally ready I have plenty sketches from which to choose what I want to do next. In art school I was criticized that I don´t understand when to stop – when the work is ready. But once I chose to make embroidery, I noticed that extravagant abundance works. I live probably in the wrong part of the world, because the pure Scandinavian simplicity is not the aesthetic I pursue at all. My biggest source of inspiration is still the advocacy work by disability rights organizations and self-advocates. My work is political and can be seen as controversial by some. I have often been asked to do works on other topics – some nice embroidery to decorate homes, for example. But for me, disability art is the thing I want to do. Political art is not dead. 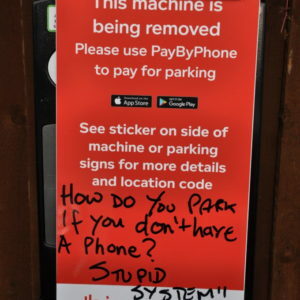 I think there is still a demand for that. There is still a lot of empty space in the margins to fill, to write and draw into.I love the freedom I have as an artist to promote disability rights. NM: How is your work political? Can you give me some examples? JJWH: In 2015 I made a provocative humourous film about the accessibility of Imatra, a city in eastern Finland. It caused a lot of anger in the beginning but two months after, the railway station there got a ramp. So that was a great moment in my career and for all the people I worked with on that project. 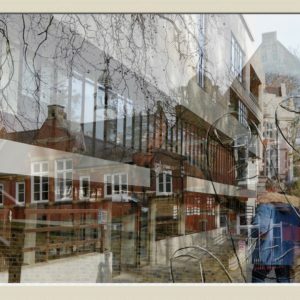 In spring of the same year I exhibited an installation about violence against women with disabilities in a library. Someone wrote an opinion letter to a newspaper saying that this is not art, but a manifestation of my “sick mind” and the local newspaper held a vote whether the installation was suitable for a public place. It felt like I had succeeded bringing a taboo subject into the public sphere. In the end, 93% of the voters were on my side, and one small piece of this installation (Welcome Anomaly!) was exhibited in London at Shape Open in 2013-2014. NM: What is it like to be a disability artist in Finland? JJWH: Finland is a small country, so it is quite easy to gain national visibility. We have a very small group of disabled artists here and art schools, community colleges, artist organizations and smaller galleries have still a lot to do to improve their accessibility. Us disabled people are still often forced to defend our equal rights. And right now, similar to the UK, the Finnish government is making drastic social security cuts, most of which will specifically affect disabled people. NM: In some of your videos and your pictures, your children and their toys are included in your artwork. Was this a conscious decision, to include them, or did it happen naturally? JJWH: My two children, Siiri-Sofia (7) and Ossi-Sakari (4) are often included in my artwork. They have both inherited osteogenesis imperfect, so they both have already had several bone fractures so far in their lives and couldn’t go to day care whenever that happened. My mom and sister also live with osteogenesis imperfect, so when I was a child, we didn’t stay in bed with casts. It was a natural choice for me to take the kids to my workroom while they were still healing. If we would stay in bed whenever someone in a family has a fracture, I could not work at all. As a result, I have done a few performances where the children participated. At times it has also been difficult to get my children to go to day care while I stay at home “to play”: Building a carousel from wheelchairs or filling helium balloons. Sometimes my work is a lot of fun – even if the topics can be deadly serious. I am drawn to contrasts. NM: You told me that you would like to connect with artists from other countries and maybe collaborate. Do you have specific ideas about what kind of a collaboration you would like to do? JJWH: Something I would like to try next is to collaborate with artists from abroad. I have a wonderful gallery space for a private exhibition in July 2017 in Vantaa, where it would be great to make some artwork together with another political disability artist. I wonder for example, what it would be like to send an unfinished artwork to another artist and to finish it co-operationally. Or ask people to use a piece of my work in their performances and send me video material about it – or vice versa. I would like to show people the beauty, variety, similarities and differences of disability culture in the world. If you an artist who would like to get in touch with Jenni-Julia, please leave a comment below or contact her via her website.